In blender, place yogurt, mango and carrot juice. Cover; blend until smooth. Reserve 1 cup mixture; cover and refrigerate. Divide remaining mixture among 6 (5-oz) paper cups, about 1/3 cup in each. Cover cups with foil; insert craft stick into center of each pop. (Or fill ice pop molds according to manufacturer’s directions.) Freeze about 2 hours or until frozen. In blender, place reserved mango mixture and spinach. Cover; blend until smooth. When first layer is frozen, remove foil from pops. Pour about 3 tablespoons spinach mixture in each cup over frozen layer. Return foil to pops to support sticks. Freeze about 6 hours or until frozen. 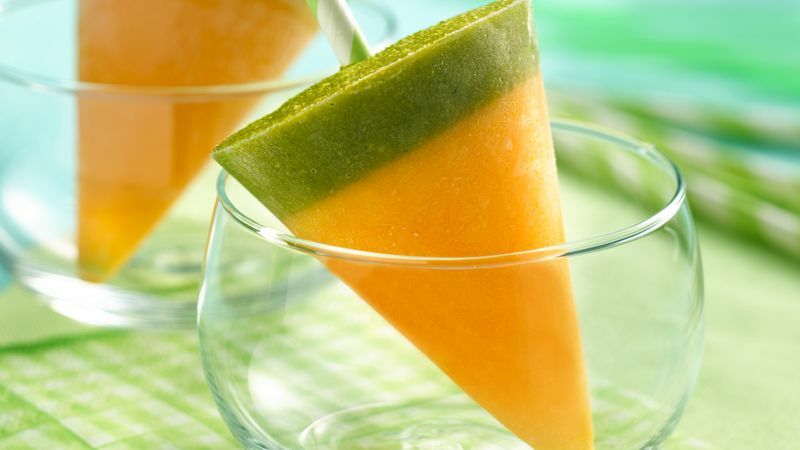 To make these pops look like carrots, freeze in 4-oz paper cone-shaped cups. For sticks, use green straws. To strengthen straws, insert lollipop sticks through straws before freezing. Look for carrot juice in the refrigerated case of the produce section.